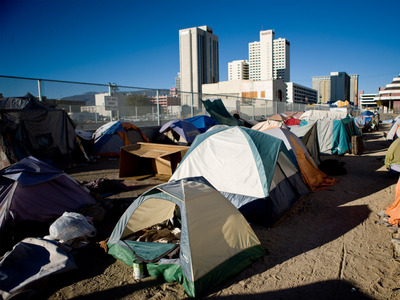 Max Whittaker/GettyA tent city for the homeless in downtown Reno, Nevada. Economists have been expecting home prices to slow, but the market isn’t budging. The latest data on sales of new and existing homes slowed more than economists had expected for a second straight month. During three quarters out of the past four, there was a decline in residential investment, which includes construction and brokers’ fees. Since the rest of the economy – particularly the job market – is in solid shape, it’s not the unwilling of buyers that’s slowing housing down. “If there’s a boogeyman in the housing market today, it’s affordability,” James Egan, Morgan Stanley’s cohead of US housing strategy, said in a note on Thursday. By one measure – the S&P CoreLogic Case-Shiller Home-Price Index – housing costs have jumped 21% since they bottomed after the recession in February 2012. The chart offers proof of how much strain the housing market is creating. It shows that Americans are paying the most in monthly mortgage payments relative to their incomes since 2008. And it’s no wonder a University of Michigan survey of consumers earlier this month found that home prices were deemed the least favourable in 12 years. “The only housing market indicator that has moved decisively higher in 2018 has been prices: Everything else is flat,” Aaron Terrazas, a senior economist at Zillow, said. Egan has more sour news: He doesn’t expect prices to fall, though he thinks the rate of growth may slow. That’s still not happening for most of the market, however. In June, the CoreLogic index showed that home prices rose at the fastest annual rate in four years and had not fallen for 14 straight months. Still, it’s more likely a matter of when, not if affordability improves. Price growth is already slowing in the luxury housing market, where there aren’t as many people giving competing offers to sellers, according to Zillow. “We believe that the current supply and demand environment will continue to push home prices higher, just at a decelerating pace,” Egan said. “This shift is likely due to a combination of historically tight underwriting standards coupled with rising home prices putting pressure on home affordability, particularly at the entry-home level,” Joe Mellman, a mortgage business leader at TransUnion, said.